Contact The Orlow Firm Today! Our attorneys are ready to help you. Undocumented workers are often asked to do the most dangerous jobs, especially at construction sites. As a result, they suffer more work-related injury and death than native-born workers. Because they are afraid of losing their jobs or being punished or deported, undocumented workers rarely complain about unsafe or unhealthy employment environments. If you are an undocumented immigrant working in The Bronx, you have certain rights if you are hurt on the job. The lawyers at The Orlow Firm can help you understand the law and will fight for your right to receive compensation for work-related injuries. Call (646) 647-3398 or contact us online for a free consultation. Courts in New York have ruled that if you are injured on the job, you should not be deprived of legal help and financial benefits just because you are undocumented. On a construction site, your employer might hire contractors or other individuals to perform certain jobs that it does not have the skilled workers to do. At times, you may be injured because a contractor or someone other than your employer is careless or negligent at the site. In New York, you have a right to file a third-party lawsuit for damages against the contractor or person other than your employer whose negligence results in your being hurt in the workplace. Workers’ compensation provides injured employees with payments for medical expenses, financial benefits, back pay and lost wages. In The Bronx, you may file for these benefits even if you are an undocumented worker. However, if you knowingly submitted false work authorizations, you may be prevented from seeking benefits. It is very important that you discuss your workers’ compensation claim with an attorney who has a thorough knowledge of the law. Employers often knowingly hire undocumented workers because they think they can legally get away with not paying for workers’ compensation insurance. Fortunately, courts in New York have ruled that employers must not be allowed to exploit undocumented immigrants by denying them the chance to file for workers’ compensation. If you are hurt on the job in The Bronx, you have the same rights as any other worker to seek compensation for your pain and suffering, medical costs and lost wages. If you are injured by a third party on the job, you are as entitled as any other employee to file a lawsuit in civil court for damages. The attorneys at The Orlow Firm are committed to making sure that injured undocumented workers receive all the benefits and compensation to which they are entitled under the law. If you are an undocumented alien and have been hurt in the workplace, contact Bronx immigrant work injury lawyers at The Orlow Firm for a free consultation. We have four offices across New York City for your convenience. We can come to you if you cannot come to us. Call (646) 647-3398 or contact us online. - Highly recommend The Orlow Firm, they're amazing. We offer free initial consultations and operate four offices across New York City for your convenience. We can go to you if you cannot come to us. We can help you! Request a free consultation. 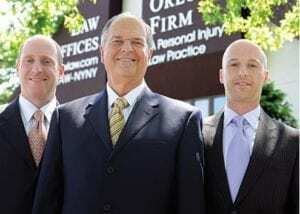 The Orlow Firm represents injured people in the five boroughs of New York City (Manhattan, Brooklyn, Queens, The Bronx and Staten Island) as well as the counties surrounding New York City.